Producers take note! Francis Barclay is back and he’s ready for prime time. 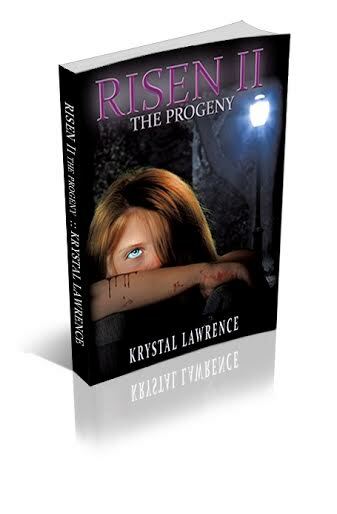 Fans of horror/suspense masters Stephen King and Dean Koontz are sure to delight in the return of Francis Barclay, the vengeful and bloodthirsty vampire resurrected from the dead after 200 years, in RISEN, by the “Mistress of Macabre,” Krystal Lawrence. Barclay, cremated at the end of RISEN, has once again returned from the ashes — and this time he’s not alone! In Lawrence’s riveting sequel, RISEN II: THE PROGENY, Barclay is working his slow and agonizing way back to Alder Lake, determined to save the child he accidentally sired. RISEN began the tale of Francis Barclay’s return to Alder Lake to avenge the centuries old murder of his family. In this spellbinding sequel, Barclay is determined to save his progeny. When last we left Alder Lake, seven year-old Lorna was waiting patiently by the window for her blood-father’s return. Her wait is now over. She has inherited Francis Barclay’s luminous glowing eyes as well as his taste for blood. Alder Lake is once again plagued by murder. Only this time, the suspect will surprise everyone! The “Risen” books may remind readers of the SOOKIE STACKHOUSE NOVELS by Charlaine Harris or Stephenie Meyer’s TWILIGHT series, but Lawrence reaches farther back for inspiration in the undead genre. She calls her novels “vampires for grownups,” in the manner of Bram Stoker’s DRACULA, the most famous bloodsucker of them all. The main similarity of the RISEN novels to Harris’ and Meyer’s books lies in their rich potential to be adapted into the kind of theatrical or television films that can’t miss in attracting hordes of dedicated fans. Risen II is available at Amazon. The sun was sinking behind the mountains as the dead boy walked on, every bone in his over-taxed body aching from strain. The constant cloud of dust and ash that floated about him like a grimy halo made flagging down car rides impossible. This journey would be made on foot, and there was a very long way to go, especially for a boy who should have been resting peacefully in his grave for some three hundred years. As the boy felt the rising breeze lift his long hair from his brow, he raised his hands to his face and groaned. He watched in silent horror, as his fingers dissolved into fine grains of ash and floated off into the mild California evening. If he did not find shelter for the night soon, there wouldn’t be much of him left to lie down tonight at all. Five years before, Francis Barclay had been cremated and interred in a vault one hundred miles east of his hometown. Though he was no stranger to rising from the dead, the first time around he was given a fully formed body to work with. This time he was comprised of hundreds of thousands of tiny flakes of burned ash, and they didn’t stay put when the wind grew restless. Worse was the odor clinging to him like an unwanted lover. He smelled like a poorly tamped-out brushfire, lingering cinders smoldering on his skin. Francis stumbled. He watched with dismay as his left foot began evaporating into fine powder, swirling in the air before him. It turned to mist, and rose into the sky above him like a departing soul, taking that miserable burnt smell with it. Before I got the chance to read Risen II: The Progeny, I was a little unsure because I hadn’t read the first book. This being the second in the series, I was concerned I wouldn’t be able to grasp the full plot unless I went back and got caught up. Thankfully, the author painted the events of the first book creatively throughout the story so that I didn’t feel as if I missed out on anything. I enjoyed this story because it was nothing like I was expecting it to be. I thought I had it figured out, but as it turns out I was very wrong. It exceeded my expectations in keeping me intrigued and motivated to continue turning page after page. To be honest, I think the creepiest aspect of the story is the fact that the culprit is fairly young and unable to control her impulses. This played well with the psychological thriller/urban horror I was hoping for and made it twice as captivating in its complexity. Definitely recommend to lovers of horror. Krystal Lawrence was born and raised in Southern California, where she was a child actress. In her late teens and early twenties she redirected her creative energy into radio, and hosted a successful talk show in Las Vegas for many years. She is the author of two previous books and numerous short stories. She now lives in Seattle where she is working on her fourth novel, PHONE CALL FROM HELL. Her latest book is the horror/suspense, Risen II. Connect with Krystal on Facebook and Twitter. Find out more about Krystal at Goodreads.